Clean and restore stainless steel surfaces around the house with this safe, simple, penny-pinching formula. Longevity and luster make stainless steel a popular choice material for appliances, countertops, and other fixtures. But the metal is notoriously prone to greasy fingerprints, smudges, and streaks, not to mention dirt and stains caused by everyday spills. What’s more, improper cleaning techniques can add to the mess on stainless. Commercial stainless steel cleansers cost between $7 and $15 per 15 ounces, but thrifty homeowners and those committed to natural cleaning approaches might prefer a do-it-yourself alternative made from bottom-dollar, chemical-free ingredients. Read on for the easy recipe and how to use your new homemade stainless steel cleaner for cleaning stainless steel around the house. Remove the spray head of the bottle and add in at least 16 ounces of food-safe all-natural cleaning vinegar such as Heinz Cleaning Vinegar, which is made with grain and water. (You’ll need more or less vinegar depending on the surface size to be cleaned: One to two ounces will cover a standard toaster, but you’ll use up to 32 ounces when cleaning a typical fridge.) Stainless steel is non-reactive to acids, so it won’t be damaged by the vinegar-based homemade stainless steel cleaner, and the six percent acetic acid content in cleaning vinegar is best suited to cutting grease and grime (plain white vinegar has five percent). NOTE: Check your owner’s manual to ensure that appliances and fixtures don’t have an oleophobic (oil-repellent) coating, which can be stripped by the vinegar solution. To offset the pungent scent of the vinegar during application, add in 10 to 20 drops of your favorite food-grade essential oil to impart a temporary fragrance. Mildly acidic essential oils such as lemon oil are safe for use on the tough metal. Secure the spray head back onto the bottle, then gently shake to combine. To use the homemade stainless steel cleaner right away, proceed with Step 4. If you plan to store the cleaner for later use, label the bottle and store it at room temperature in a dry location where kids and pets can’t access it. Fill a small bowl with one to two ounces of food-grade mineral oil (available from brands like UltraSource) to polish the metal after using your homemade stainless steel cleaner. Avoid olive or other cooking oils, which will go rancid with prolonged exposure to sunlight. Start using the cleaner and mineral oil on all your stainless steel surfaces! • Determine the direction of the “grain” (i.e., the pattern of lines) on the stainless steel—either horizontal or vertical. You’ll want to avoid cleaning against the grain, which will leave streaks of cleaner. • Moving in the direction of the grain, wipe down the sprayed area with a microfiber cloth (avoid abrasive scrubbers like steel wool, which can scratch) to dust, grit, and loosened grime. Be sure to wipe around knobs, levers, and other grooves and recesses. Repeat the process of spraying and wiping to clean the entire appliance. • If you still see stains or buildup, spray additional homemade stainless steel cleaner on the problem area and use the microfiber cloth to vigorously wipe in the direction of the grain. Once the steel is clean, immediately wipe up any errant liquid with the microfiber cloth (the cleaner can leave streaks if left to air dry). • Dip a clean soft cloth in the mineral oil and gently rub down one face of the appliance at a time in the direction of the grain to erase any streaks or prints and lend a lustrous shine. Make a second pass over the rubbed areas with a clean soft cloth to remove excess oil and boost the shine. Repeat this step on the other areas of the appliance until you’ve polished it to perfection. 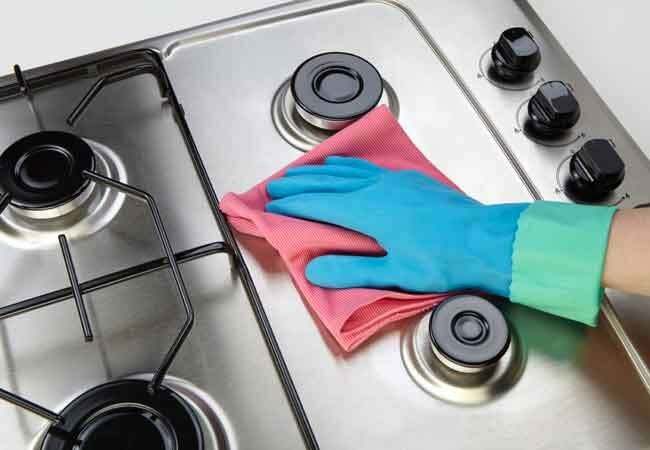 • Heed these next tips on cleaning specific types of appliances and fixtures. Small appliances: For a toaster, portable microwave, or similar device, unplug the unit and allow it to cool completely. Large or built-in appliances: For refrigerators, dishwashers, microwaves, and cooktops, there’s no need to unplug the appliance. Just be sure that heating appliances are turned off and cool. Countertops and sinks: Turn off off sink faucets. Avoid spraying the cleaner on unsealed grout at the edges of countertops or sinks; vinegar will be readily absorbed by the ultra-porous surface of the grout and prematurely weaken it. Range hoods: Turn off the light and exhaust fan prior to spraying. Cookware: This food-safe formula is ideal for use on stainless steel pots and pans. If cookware is scorched or bears burnt food remains, give the cleaner at least 15 minutes of dwell time to loosen crud before wiping it clean.